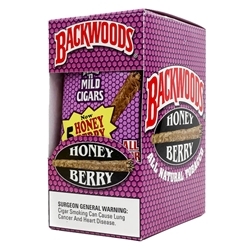 Backwoods Honey Berry Cigars, is a cigarillo style cigar wrapped in an all-natural Connecticut broadleaf, infused with 100% natural tobaccos. The Honey Berry is designed with a tapered body, unfinished head and frayed at the end. Each of these cigars offers tastes of fresh picked berries and sweet golden honey flavors. The Backwoods Honey Berry cigars are smooth and machine made featuring the most enjoyable tastes of fresh picked berries and sweet honey. Each unit contains 8 convenient packs of 5 cigars.